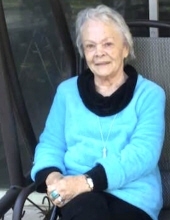 Betty L. Irvin, 78, of Kinsman, passed away at 10:04 pm on Wednesday, April 10, 2019 at Morris Hospital. Cremation rites have been accorded and no services are planned. Hager memorial Home in Dwight is handling the arrangements. Betty was born in Dwight, Il on May 5, 1940 a daughter of Edward and Amelia (Holt) Miller, she married Floyd Irvin, he survives. Also surviving are her four children: Floyd Dean (Jesika) Irvin of Bradley, Penny (Vern) Arnold of Reddick, IL, Ed (Tanya) Irvin of Normal, IL, Marion (Sandy) Irvin of Dwight; twelve Grandchildren; eleven great grandchildren. She was preceded in death by her parents, brothers: Marvin, Melvin, Wayne, Marion and Floyd Miller; sister: Penny Brady. "Email Address" would like to share the life celebration of Betty L Irvin. Click on the "link" to go to share a favorite memory or leave a condolence message for the family.